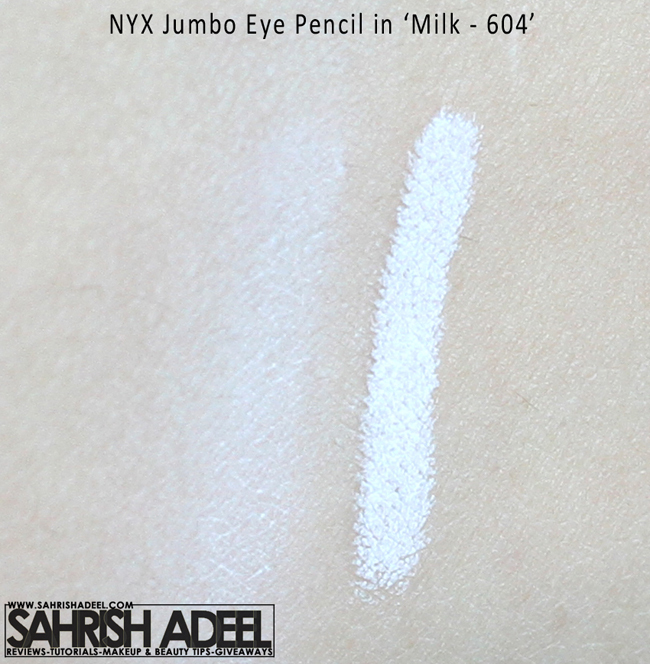 Jumbo Pencil in 'Milk - 604' by NYX - Review & Swatch! | Sahrish Adeel - Malaysia based Pakistani Beauty & Lifestyle Blogger! Jumbo Pencil in 'Milk - 604' by NYX - Review & Swatch! We have seen NYX's Jumbo Pencils in action for so long and web is full of rave reviews with qualities of this favorite pencil of so many makeup experts. How could I not contribute with my review and experience about this awesome pencil. This specific Jumbo Pencil is in 'Milk - 604' and was sent to me by BlancIINoir. It came nicely packed in a hard box with packing material to make the package more secure. This pencil has a creamy texture and has a transparent cover which securely fixes and does not go off easily in travel or hand bag. Cream texture glides smoothly on skin. Blends easily with finger or a brush. Multipurpose - Works best as eye shadow base and eye liner. Keeps the eye shadows same as you applied first for all day long. Enhances the colors of the eye shadows if applied as a base. Might crease on extra oily lids so an eye primer is a must. I read many reviews about this pencil and saw many makeup gurus using Jumbo Pencils by NYX, specially this one in Milk as an eye shadow base for bright colors. I got a chance to use this jumbo pencil and I am now a big fan. I have been using eye shadow primer for some time and it worked great to stop creasing and bringing up the colors much enhanced. But when I used this Jumbo Pencil in Milk on top of my eye primer and applied my eye shadows, they came up way more brighter and enhanced than before. Eye shadows stick really nicely, resulting less or no fall outs and they don't tone down even after 8 hours. Funky and bright eye shadows look absolutely stunning on top of it no matter what brand you use. 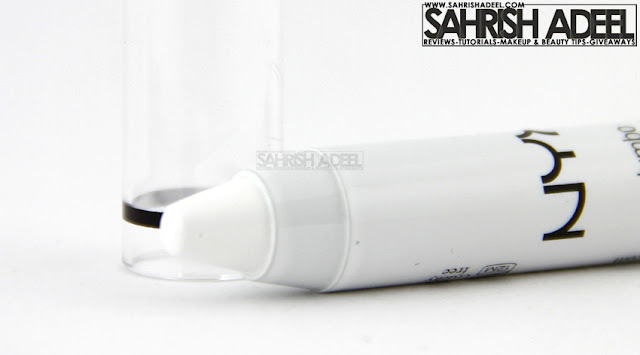 I have noticed slight creasing if I don't apply an eye primer under Jumbo Pencil when I am using it as a base as I have got oily lids but with a primer, it works absolutely fine. I also apply it on my waterline and set it with a white powder but it does not stay for more than 1 hour. Overall, I am in love with this Jumbo Pencil in Milk-604 and I am looking forward to try more shades in this pencil. NYX's Jumbo Pencil is available in 32 beautiful shades. BlancIINoir - They sell is for $4.50 & they ship worldwide. NYX's official website - They sell it for $4.50 & they ship to US only. Beauty Unleashed - They sell it for PKR 725 & they ship to Pakistan only. Colors Cosmetics Malaysia - They sell it for RM 18 & they ship to Malaysia only. Have you tried any NYX's Jumbo Pencil before?